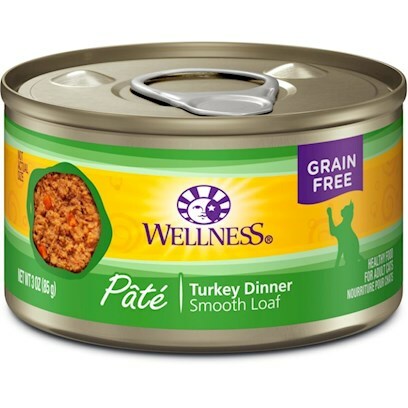 Wellness Canned Turkey Recipe is an excellent source of high quality protein, made with high quality turkey free of added growth hormones and steroids. We use turkey as our most plentiful ingredient because it is a flavorful, digestible protein source. This recipe also includes delicious sweet potatoes and carrots as an excellent source of vitamins, minerals and beta-carotene. Fresh, whole cranberries and blueberries are added to help maintain proper urinary tract health. Turkey, Chicken Liver, Chicken, Chicken Broth, Carrots, Natural Chicken Flavor, Sweet Potatoes, Squash, Zucchini, Cranberries, Blueberries, Guar Gum, Carrageenan, Ground Flaxseed, Potassium Chloride, Calcium Carbonate, Dicalcium Phosphate, Taurine, Iron Proteinate (a source of Chelated Iron), Beta-Carotene, Zinc Proteinate (a source of Chelated Zinc), Vitamin E Supplement, Choline Chloride, Cobalt Proteinate (a source of Chelated Cobalt), Thiamine Mononitrate, Copper Proteinate (a source of Chelated Copper), Folic Acid, Manganese Proteinate (a source of Chelated Manganese), Niacin, d-Calcium Pantothenate, Sodium Selenite, Vitamin D-3 Supplement, Pyridoxine Hydrochloride, Riboflavin Supplement, Vitamin A Supplement, Vitamin B-12 Supplement, Potassium Iodide, Biotin. "For adult cats, feed about 1/2 can per 6-8 lbs. of body weight per day. Feed at room temprature and refrigerate unused portion. Your cat should always have access to clean fresh water. Transitioning to Wellness It is important to slowly transition your pet from his/her current diet as it takes a few days for the body to adapt to the new nutrient levels. To transition, gradually mix in the new food over a 5-7 day period, increasing the amount of Wellness each day, so that you are feeding 100% Wellness by day 7. Combination Feeding: Keep a clean bowl of fresh water available at all times. Wellness believes in feeding dry and wet food in combination whenever possible to help increase the level of water in your dog’s diet. "